Like a string, a list is a sequence of values. In a string, the values are characters; in a list, they can be any type. The values in a list are called elements or sometimes items. Unlike strings, lists are mutable. When the bracket operator appears on the left side of an assignment, it identifies the element of the list that will be assigned. The one-eth element of numbers, which used to be 123, is now 5. Lists are represented by boxes with the word “list” outside and the elements of the list inside. 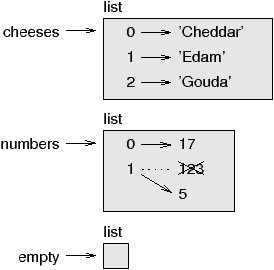 cheeses refers to a list with three elements indexed 0, 1 and 2. numbers contains two elements; the diagram shows that the value of the second element has been reassigned from 123 to 5. empty refers to a list with no elements. This loop traverses the list and updates each element. len returns the number of elements in the list. range returns a list of indices from 0 to n−1, where n is the length of the list. Each time through the loop i gets the index of the next element. The assignment statement in the body uses i to read the old value of the element and to assign the new value. The first example repeats  four times. The second example repeats the list [1, 2, 3] three times. Since lists are mutable, it is often useful to make a copy before performing operations that fold, spindle or mutilate lists. List methods are all void; they modify the list and return None. If you accidentally write t = t.sort(), you will be disappointed with the result. As the loop executes, total accumulates the sum of the elements; a variable used this way is sometimes called an accumulator. An operation like this that combines a sequence of elements into a single value is sometimes called reduce. res is initialized with an empty list; each time through the loop, we append the next element. So res is another kind of accumulator. An operation like capitalize_all is sometimes called a map because it “maps” a function (in this case the method capitalize) onto each of the elements in a sequence. isupper is a string method that returns True if the string contains only upper case letters. An operation like only_upper is called a filter because it selects some of the elements and filters out the others. Write a function that takes a list of numbers and returns the cumulative sum; that is, a new list where the ith element is the sum of the first i+1 elements from the original list. For example, the cumulative sum of [1, 2, 3] is [1, 3, 6]. pop modifies the list and returns the element that was removed. If you don’t provide an index, it deletes and returns the last element. Because list is the name of a built-in function, you should avoid using it as a variable name. I also avoid l because it looks too much like 1. So that’s why I use t.
In this case the delimiter is a space character, so join puts a space between words. To concatenate strings without spaces, you can use the empty string, '', as a delimiter. Until now, we have been using “object” and “value” interchangeably, but it is more precise to say that an object has a value. If you execute [1,2,3], you get a list object whose value is a sequence of integers. If another list has the same elements, we say it has the same value, but it is not the same object. Since the list is shared by two frames, I drew it between them. Write a function called chop that takes a list and modifies it, removing the first and last elements, and returns None. Then write a function called middle that takes a list and returns a new list that contains all but the first and last elements. Don’t forget that most list methods modify the argument and return None. This is the opposite of the string methods, which return a new string and leave the original alone. Before using list methods and operators, you should read the documentation carefully and then test them in interactive mode. The methods and operators that lists share with other sequences (like strings) are documented at docs.python.org/lib/typesseq.html. The methods and operators that only apply to mutable sequences are documented at docs.python.org/lib/typesseq-mutable.html. One of the values in a list (or other sequence), also called items. A relationship in which each element of one set corresponds to an element of another set. For example, a list is a mapping from indices to elements. A variable used in a loop to add up or accumulate a result. A statement that updates the value of a variable using an operator like +=. A processing pattern that traverses a sequence and accumulates the elements into a single result. A processing pattern that traverses a sequence and performs an operation on each element. A processing pattern that traverses a list and selects the elements that satisfy some criterion. Exercise 3 Write a function called is_sorted that takes a list as a parameter and returns True if the list is sorted in ascending order and False otherwise. You can assume (as a precondition) that the elements of the list can be compared with the relational operators <, >, etc. For example, is_sorted([1,2,2]) should return True and is_sorted(['b','a']) should return False. You can read about this problem at wikipedia.org/wiki/Birthday_paradox, and you can see my solution at thinkpython.com/code/birthday.py. Write a function called remove_duplicates that takes a list and returns a new list with only the unique elements from the original. Hint: they don’t have to be in the same order. Write a function that reads the file words.txt and builds a list with one element per word. Write two versions of this function, one using the append method and the other using the idiom t = t + [x]. Which one takes longer to run? Why? You can see my solution at thinkpython.com/code/wordlist.py. To check whether a word is in the word list, you could use the in operator, but it would be slow because it searches through the words in order. Because the words are in alphabetical order, we can speed things up with a bisection search (also known as binary search), which is similar to what you do when you look a word up in the dictionary. You start in the middle and check to see whether the word you are looking for comes before the word in the middle of the list. If so, then you search the first half of the list the same way. Otherwise you search the second half. Either way, you cut the remaining search space in half. If the word list has 113,809 words, it will take about 17 steps to find the word or conclude that it’s not there. Write a function called bisect that takes a sorted list and a target value and returns the index of the value in the list, if it’s there, or None if it’s not. Or you could read the documentation of the bisect module and use that! Two words are a “reverse pair” if each is the reverse of the other. Write a program that finds all the reverse pairs in the word list. Write a program that finds all pairs of words that interlock. Hint: don’t enumerate all pairs! Can you find any words that are three-way interlocked; that is, every third letter forms a word, starting from the first, second or third?